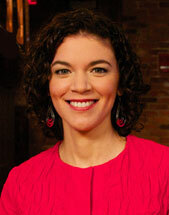 Margarita Martinez is the host of WGBH-TV's Neighborhood Kitchens, now in its second season on WGBH-2. Margarita has always had an insatiable appetite for travel and food. She made her first empanada as a teenager visiting Argentina, satisfied her sweet tooth with poffertjes and stroopwafels while studying in Holland, engorged herself on Thai street food for a month in Bangkok, and continues to search for authentic international cuisines in the Northeast. Margarita loves to discover new ingredients, flavors, and cooking approaches that she can bring to her own home kitchen. It is an immense pleasure for her to have the opportunity to explore New England neighborhoods and further educate herself in the cuisines of the world as the host of WGBH’s Neighborhood Kitchens. In addition to food, Margarita is passionate about acting and music and has performed in numerous plays and films in New England and New York City. Margarita graduated from Tisch School of the Arts at NYU with a BFA in Drama.